The Arctic Circle’s infamous Northwest Passage confounded explorers for hundreds of years, until Norwegian explorer Roald Amundsen successfully navigated it in 1903. Once thought a myth, the route offered a potentially invaluable way to shorten the sea voyage from Europe to the Far East, but when Amundsen eventually proved it was real, it turned out to be commercially useless for shipping purposes. The majority of the route was frozen solid and, where it was navigable, its waters were too shallow to allow large vessels through. The passage would remain a footnote in the history of Arctic exploration until 2009, when satellite imagery showed that it had melted to the point that it appeared to be able to accommodate large vessels. Dispatched to report from the scene, BBC reporter David Shukman discovered the new controversy surrounding the route that Amundsen had forged almost 100 years previously – now that it looked like it might be a source of revenue, a major dispute had begun over which country owned it, with Canada claiming the right to tax transit through the area. The story is one of a number recounted by Shukman in Reporting Live from the End of the World, an account of his initiation into the world of environmental reporting. Having initially started out reporting from the North in the mid-1980s, Shukman moved on to become the BBC’s defence correspondent, before switching to European affairs and, later being appointed world affairs correspondent. By 2003, years of reporting from war zones had left him burnt out. Even so, when it was first suggested that he become the BBC’s environment and science correspondent, he wasn’t keen; a self confessed sceptic on green issues, he initially felt that the job represented a step down to a field he considered dull and comparatively unimportant. However, as the scope of the job was made clear to him and he began to explore his new brief, he became increasingly convinced of the area’s importance. 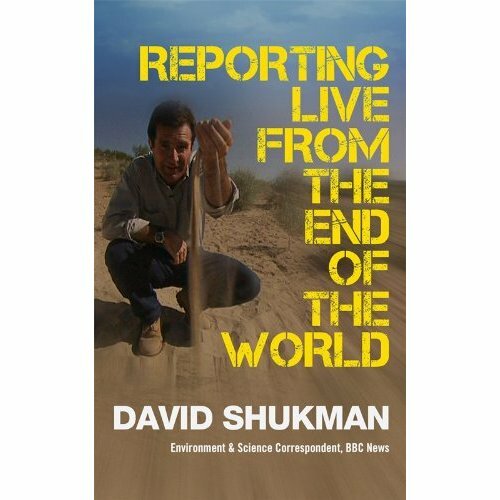 The experiences he recounts in Reporting Live from the End of the World make for an engaging read, as well as providing an interesting account of just how green issues are reported by the mass media. One of his more telling anecdotes relates a tense exchange with a floor manager and cameraman while he waits in the wings of a TV studio, killing time before going on air. The news item concerns a report on new government sponsored research into the threat of rising sea levels in the next century, and while running through his script, a cameraman takes him to task. ‘‘If the seas are rising, how can that be blamed on global warming? How do they know there isn’t a perfectly natural reason for it?” Shukman replies that he’s a correspondent, not a campaigner, that he’s merely reporting and doesn’t have an agenda. But time and time again, he is accosted by hardliners on both sides of the great environmental debate. When the subject of global warming and climate change comes up, Shukman finds himself continually confronted by well meaning members of the public demanding to know why, if climate change is happening, they are seeing more rain/ sun/snow/drought/delete as applicable in their area. When he reports on evidence supporting the idea that global warming is manmade, he is accused of being an ideological believer, one of the irrational faithful. But when he presents the weaknesses in some arguments and the lack of scientific rigour in some research, he’s accused of being part of a media conspiracy. The book has plenty of entertaining snippets about the practical issues that come with trying to broadcast live from remote islands, snowy wastelands and ocean-going vessels. Technology has made things easier, but heavy equipment still has to be carried by hand, often to remote locations, and broadcasters are at the mercy of weather conditions and environmental factors. Shukman travels with his team to the Midway Atoll, a coral island in the South Pacific which is 2,000 miles from the nearest continent, but also located right in the middle of tidal currents linking the northern and southern hemispheres. Despite its official status as a wildlife reserve – the island is home to around two million albatrosses – its white sandy beaches are covered in rubbish: lengths of rope, shampoo bottles, computer component casings and plastic sheeting. The island has internet access, allowing the team to broadcast a signal, but in order to free up enough bandwidth for a successful transmission, they have to ask everyone on the island not to use the internet for the time required. This, and stories like it, form the bulk of Shukman’s book, making it more of a personal memoir than an issue driven polemic. And it’s precisely because he’s not out to convert people that Reporting Live from the End of the World is as effective as it is, and offers a balanced and thought provoking account of how green issues affect our day to day lives.